'Pineapple Express' pattern for drought stricken California is shaping up – how long will it last? | Watts Up With That? 'Pineapple Express' pattern for drought stricken California is shaping up – how long will it last? From NASA JPL, video animation follows. Wet weather is again hitting drought-stricken California as the second and larger of two back-to-back storms makes its way ashore. The storms are part of an atmospheric river, a narrow channel of concentrated moisture in the atmosphere connecting tropical air with colder, drier regions around Earth’s middle latitudes. The storm that arrived on Feb. 26, 2014, and the one about to hit, are contained within the “Pineapple Express,” an atmospheric river that extends from the Pacific Ocean near Hawaii to the Pacific coast of North America, where it often brings heavy precipitation. This next storm is expect to be the largest rain producer in Southern California in three years. 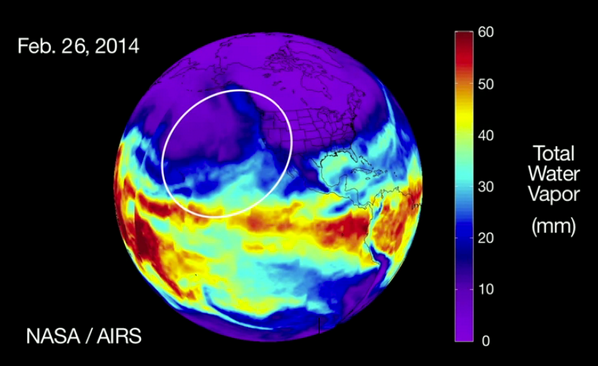 This animation, created with data acquired by the Atmospheric Infrared Sounder (AIRS) instrument on NASA’s Aqua satellite, shows the total amount of water vapor contained in the atmosphere for most of the month of February if it were all to fall as rain. Typically, the atmosphere over Southern California and most of the continental U.S. in winter holds only about 0.4 inch (10 millimeters) or less of water vapor. However, much wetter air lies tantalizingly close in regions to the south and west. The largest amounts of atmospheric moisture, up to 2.4 inches (60 millimeters), are associated with a persistent band of thunderstorms circling the tropics. These thunderstorms are the source of several atmospheric rivers apparent in this animation. One atmospheric river arises near Hawaii around Feb. 10 and comes ashore in Central California a few days later, bringing the largest Sierra Nevada snowfall of the season to date. Other atmospheric rivers can be see originating in the Gulf of Mexico and extending into the Atlantic on the right side of the movie; the northward movement of tropical water vapor is important in winter storms in the eastern U.S. and Europe. The animation concludes with the current Pineapple Express. Moisture from around Hawaii has surged northeast, and the persistent, dry air immediately west of Baja California has been replace by air with up to 1.6 inches (40 millimeters) of water vapor. The next storm will bring that moisture ashore, where it will be forced upward by coastal mountains to fall as heavy rain. Up to 8 inches (20.3 centimeters) of rain is predicted in some parts of the Los Angeles area by March 2, bringing possible flooding and landslides to recent wildfire burn areas. The recent cold conditions in the eastern U.S. are also apparent in this movie as very dry regions. Because cold air can hold relatively little water (less than 0.4 inch or 10 millimeters), cold region are always dry. So, the eastern U.S. has some of the driest air in this animation. However, high pressure systems also dry the atmosphere by forcing down air from above. That descending air expands and warms, but retains the low moisture amounts it had when it was higher and cold. So, cold Minnesota and warm Mexico have similar water vapor amounts in this movie. February 28, 2014 in Drought, Rainfall, Weather. Obviously Obama’s visit to California where falsely claimed that our states drought was caused by man made climate change has taken on the “Gore effect” outcome. Perhaps Obama should make more visits to naturally occurring drought areas and make similar flawed claims as in California so these areas could receive help from Mother Nature. Looking at the GOES water vapor loop from NOAA, you will see almost an eye-like structure in the storm currently headed to shore. It does a good job of showing how California gets its reputation. But I guess due to the short duration, it does not show how the NW is just the opposite. That’s Obama’s place in history then, The Man Who Made It Rain In California. bets on whether they miss-manage this water too…. Lots of moisture in the Gulf of Mexico poised to come north as this storm rolls across the USA. Rain to the south, but where it collides with cold air to the north there will be little talk of spring, and much muttering as people shovel themselves out.. In its wake the storm may well drag down cold air that will set records. Journalists are feverishly reviewing their articles from past years so they’ll be ready to write more woeful articles about the devastating mudslides which will be caused by the rains they were recently complaining hadn’t come. Within 1 degree of the all-time, never in recorded history record. Bit of wind chill on tthe side. There is a weak association between El Nino and slightly wetter than average conditions in Coastal and Northern California. Maybe if the predictions of an El Nino are correct, the drought plagued state will get some much needed relief. This could be a sign of that. On the other hand, there is no guarantee it will work out that way. As the old joke goes, there are four seasons in California: earthquake, fire, drought and flood. I got 3 inches of rain overnight in the LA hills. It looks like a lot more to come. The “Dirty Thirties” encompassed a decade of drought. There was never a reason to think it wouldn’t happen again. So since the drought is caused by global warming, will the mudslides also be caused by global warming? In 2010 / 2011 there were unbelievably wet months of March, April, and May in the Sierra Nevada, now called “The March Miracle” by Tahoe are ski resorts. At the 8000 ft elevation, Squaw Valley USA had a total of 454 inches of cumulative snowfall for the season entering March, and by the end of March it was up to 691″, and by 6 June it was 810″, a new all-time record for Squaw. I hope we are looking at another March Miracle, as currently Squaw’s seasonal snowfall total stands at only 168 inches, less than 1/4 of what they had received on this date three years ago. I’m sorry to have to ask what may be a rather basic question, but by why mechanism does the descending air expand? I had always been under the impression that the atmosphere was arranged with the denser air closer to the earth’s surface. Also, it would seem to me that expanding air would cool, wouldn’t it? Please would some kind soul help me understand? Cool animation. The atmospheric river looks like a loose firehose flapping up and down the West Coast. You’ll note that it was pointed at Vancouver/Seattle a few days ago, and yes we got wet. After such a long dry spell, the dangers of flash flooding in California is a concern. Hopefully the small rains they had a few days ago will have opened up the soil a bit. There is no connection to Hawaii moisture, their precipitable waters are well BELOW NORMAL and a look at the evolution reveals this is coming out of the northern branch, from the west northwest . What are we growing pineapples south of Alaska now. Oh, I see. That’s a plausible explanation. we’ll have to wait & see what the rest of “Rain-pocalypse 2014” brings us. This may be extremely interesting from my point of view. I need to digest it when I get time. Reminds me of a question I had when the hurricane/TD (Debbie maybe) parked itself off the west coast of Florida at the time of the Republican Convention in 2012. That atmospheric river was clearly visible for quite a while flowing north along the eastern US coast. I’m going to need to put off some pressing issues while I take this opportunity to add to my vast wealth of economically (my point of view) useless knowledge. The water vapor loop shows a large area of dry air all around Hawaii and over to a couple lonely Tstrms below Baja California. Kenny T is that your missing heat by chance??????? They tend to be rather short-lived structures, I suspect that they arise much like a hurricane eye but don’t have the support to maintain them for very long. I’d love to see a hurricane hunter plane investigate one, though it would be tough to time and the icing might be horrendous. Are the two graphics showing the same thing or related? Would the low pressure be pulling an atmospheric river in from the southern boundary as shown in the lead post? Are both correct? I’m all eyes and ears. This link explains how descending air warms. Thank you, Roger. I had expected that descending air would warm — I have a vague understanding of adiabatic heating. The article says “descending air expands”, which is what I did not expect, and does not seem to be consistent with my meager grasp of thermodynamics. Thanks, Gary. I read a little on Hadley cells, but I couldn’t discern how those might explain how descending air could expand. Such an event would seem to imply, at least to my simple mind, that the pressure was lower below than it was above. Were such a situation to occur, would it not be resolved very quickly by air rushing into the hole from all sides? What’s current today started a couple of days ago with regards to atmospheric moisture and it’s transport. But what does the Distinguished Professor of Meteorology have to say about the current Californian weather/climate? That will be an opinion which can be relied upon. I showed my 9th grade Earth Science students the satellite pics 3 and 2 days ago, pointing out the moisture trail from Hawaii up into the storm. Then I explained to them about the Pineapple Express, and what happened in CA in 1969. I then told them that it looked like this moisture would get sucked in and rotate around and nail us Fri. We just got .25 inches last night, and another .28 inches in 40 minutes right after lunch today. Watched it come in on the satellite view the whole time Since Wed. In 1969 a large part of the Central Valley flooded when repeated Pineapple Express storms throughout the month of April washed near record snows down from the Sierras. Hopefully we’ll get something like that pattern again this year. As I understand it, when California does not get enough water then that is Climate; and if it does get a bunch of rain or snow then that is weather. Do I have my definitions right? This is sloppy thinking or sloppy writing. Air doesn’t “hold” the water, any more than the nitrogen “holds” the oxygen or CO2. It’s the volume and temperature that “hold” the water. You are correct. Unless you’re in Britain where flooding rains are climate but massive Scottish snow is weather. Did this thread hit a pause? Let’s roll. Joe Bastardi – Your article showing “what nonsense this is” is paywalled at weatherbell.com. If you’re refuting something on a free website in a free public forum, don’t make us pay to see what you say. You might as well just keep your comments to yourself. It is the wettest drought ever. The climate business seems to be full of poor analogies. a river by definition is a body of water that normally flows within boundaries. There are no fixed boundaries in the atmosphere. There a no ‘rivers’ in the atmosphere. How can we educate people if we use language like this? Both low pressure systems are pulling in surrounding low level air and convection and structure aloft lifts the air in the center. There are major differences between tropical storms, driven mainly be vertical temperature differences and extratropical storms, driven by horizontal temperature differences and fronts extending from the low. The current Pacific storm isn’t pulling in much moisture from the south. Instead, it’s getting moisture from the north and northwest (on the other side of that dry slot). Then it’s wrapping it around to the south and up into California. There are some impressive photos of tropical feeds into both Pacific and Atlantic storms, and they produce a lot of precip when their winds lift over hills or fronts. http://www.theweatherprediction.com/weatherpapers/009/ may describe the Pineapple Express well and has a satellite photo showing a feed into Seattle. http://addins.wrex.com/blogs/weather/2010/02/east-coast-blues shows a nor’easter and its cold front that I think is also feeding the storm from the tropics. Here is a piece of a comment which I left 6 days ago at the Telegraph, a UK msm. I did notice an offset between Atlantic storms producing large events and Pacific storms producing large events, while observing historical data records. I should have made notes when the thought first came to mind. I am not sure about the one year aspect, completely. There is some level of an offset though. In the current case, there is a lot of dry air showing below 40N in the Pacific. It doesn’t look like a huge event for the northern part of California. Although for the southlands it might be more productive. There has been only a smattering of rain in the Trinity Co area so far from any of these recent storms. My assumption is that next year could be wetter up here, if the Pacific follows the Atlantic as past records show. Overall, I expect the next large flood for No California and areas further north to hit in the winter of 2016/17. Your “volume and temperature” is excessively vague and provides no guidance to people who don’t realize a vacuum doesn’t have a temperature. Also, while I wouldn’t say nitrogen holds oxygen and water vapor, I have no trouble saying air holds any or all of its components. Air contains (and holds) N2, O2, Ar, H2O, CO2, etc. Brian… the original “Miracle March” was actually back in 1991, when we went into the month at about 19% of average snowpack. We finished the month up at about 70% of average for that time of year…. a huge boost at the time, especially as we were in the midst of a multi year drought at the time. They sort of stole the phrase in 2011… and although it was a good wet spring, the two Marches really didn’t compare. And there are some similarities to the climactic patterns this year and that, although there’s really no way to tell if our new-found wetter pattern will last throughout the month. And I think Joe Bastardi is right…at least technically. This latest storm over CA/NV right now isn’t an atmospheric river, although you can make a case that the PW wrapped up in the current closed low was initially fed by an AR. But the direct tap from the tropics has been cut off, and it shouldn’t be described as an AR at this time. Yet, NOAA points out that these ‘skyrivers’ can hold water equal to 30 times the flow of the Mississippi River. That is a large volume of water. I like the term ‘skyrivers’. Yes, these flows can meander and shift as they travel. Here’s another good post (if you ignore the Nemo graphic) of the 2013 blizzard. There are photos showing the connection down to Bermuda and also the eye-like structure that sure looks like an eye. Gravity is what causes the pressure to be higher near the surface. The column of air from the ground to the troposphere has weight to it and it causes pressure. Air is colder up high away from the relatively warm surface of the earth. So a high pressure system will push that colder air downward. When it falls downward is does get denser – but it also expands because it warms. Air which contains “x” amount of water at some given temperature, will be drier at a higher temperature because warmer air can hold more water. That makes it harder to precipitate. You might notice in CA, when it cold outside, we could have 60 or 70% humidity at 30 degrees F. When you warm that air in your home, it’s very dry – nose bleed dry at 70 degrees F.
Dan, you say it’s the volume and temperature that “hold” the water – volume and temperature of what? The cold air, perhaps? So, what you say “holds” the water does not differ from the article in meaning, merely in word choice. Methinks your criticism displays the sloppy thinking. If you *somehow* cause a chunk of air to fall, it will warm. And because it is warmed, it will expand. So if you had a huge fan in in sky facing toward the surface, that could the cause of this. So fan and it’s large extension cord, explains where the energy is coming from. And for chunk of air to fall it needs some source of energy- something driving it. So that warmed air has energy, is practically redundant, but for there to be descending air there also has to be energy which is involved which causing this to occur. If wet air rises, it cools and water can condenses [warms]. When wet air falls it warms and if water can condense [it warms]. Or “weather” are engines which are converting energy- which tend to involve water vapor as the fuel for these engines. How can a parcel of air of a given mass get more dense while also expanding? I had always imaged density to be the ratio of mass to volume. That would be what I would think. But then, by expanding, won’t it cool back down? Its temperature rises in proportion to the increase in density (someone once intimated to me that PV=nRT — would this apply here, at least approximately, or does R somehow change?). That could be the case, but I don’t feel I’m in a position, with my rather feeble understanding of the laws of nature, to suggest it in so many words. But, assuming it’s an error, does it then somehow weaken the explanation of the process in the article? Some interesting warnings, watches, alerts and statements. 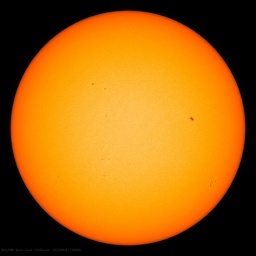 Sun Spot, dontcha know that weather history started in 1979, a year with the coldest temperatures since the Little Ice Age and the highest Arctic sea ice cover since the satellite era began? Sheesh! I believe Mr. Wykoff should win a prize when the media reports the above! We are moving from the disaster of a lifetime to mere disaster. I hope it rains until June. That is a lot to ask, though. The good, the bad, and the ugly. California gets drenched in much needed rain. Oregon gets its wheat crop hammered with the third wave of freezing temperatures. This page with reservoir data in California is always interesting. Please note in the animated graphic as linked in the lead post that it begins on Feb 1 and ended Feb 23. At the end it appears to show the low forming off Cal. So I guess you would be right as to the current supply of moisture. Would it be likely that much of that earlier atmospheric river is now caught up in the low? I wish I could find out how to reach archives with regards to the wind map beginning several days ago. I wish I could find out how to reach archives with regards to the wind map beginning several days ago. If you’re talking about the earth.nullschool.net map, click on “earth” and select the double caret [<<] in the "control" line until the URL shows you the day you want. Or you could alter the url. Not with an adiabatic process in the atmosphere, which is a basic process of the atmosphere. This from Wikipedia is a pretty good explanation of adiabatic heating and cooling (with some of the math if you want to go into that). Search around for adiabatic process in the atmosphere and I am sure you will find lots of articles. Where did the greatest amount of moisture come from that is caught up in the current low? Did that earlier atmospheric river lead to the creation of that low? The link you offered in your comment http://www.ospo.noaa.gov/data/sst/anomaly/2014/anomnight.2.27.2014.gif is of sea surface temp anomaly. Mixing apples and oranges in the same basket can/does cause confusion. Play around with it. Go back a couple of weeks and advance daily. Neat! It would be nice if someone here could animate over a period of a few weeks. Your comments on links between UK weather and Californian weather are interesting. I would suggest that you might get quite a bit of rain in 2014 as well as in 2016/7, since in Britain we had a major drought from 2010 to April 2012 (at which point a third dry summer/winter would have led to major Government headaches), which broke decisively in the second quarter of 2012, resulting in a very wet, washout summer. Summer 2013 was hot and dry after a late winter and cold spring. The heavy rains started in December 2013 and continued for 3 months. If the links are similar, you might also like to look at autumn/winter 1976/7 in the UK (which was very, very wet following the hottest driest summer in living memory) and whether or not you saw a drought in 1978 and a very wet winter of 1978/9. 1929/30 in the UK also had an incredibly wet winter, so you might want to look at the the 1931/33 period to see in California suffered similarly. Hyper physics addresses the “warm air holds more moisture” issue. Perhaps the text has the wrong word! Air pressure is the concept that molecules move and hit each other or a surface. The more of them and the more rapidly they move the more force they exert and that is the pressure. The SI unit for pressure is the pascal (Pa), equal to one newton per square metre. Note under the table the 2nd paragraph about “once commonly measured” and so on. A careful reading indicates why the term “weight” has been used in the past, as in “the weight of the atmosphere” but this is considered outdated terminology. This site has a cartoon-like animation under which it says, “The temperature of an ideal monatomic gas is a measure of the average kinetic energy of its atoms.” Find the heading “Assumptions” — there find easily understood aspects of the ‘ideal’ situation. High cold air has molecules mostly of nitrogen and oxygen thinly distributed and of low average kinetic energy. Thus, a low temperature. With relatively low buoyancy beneath this air, gravity can pull the molecules toward the surface and by so moving, they get closer together. Think of the number being the same while the volume contracts. So, density increases. Being more densely packed they tend to collide more frequently and the average kinetic energy increase. This is measured as an increasing temperature. In a large high pressure system over the ocean the descending air can warm to the point that it is a bit warmer than the air in contact with the ocean. This produces a temperature inversion (warm over cool) rather than the expected tendency of near surface air of cool above and warm below – that causes the air to “turn” (the Troposphere). In the subtropical areas there are large persistent HIGHs such that they have names. Search, for example for Azores High. Because of the situation described in the previous paragraph, the horizontal air (wind) can be extremely calm and the air hazy with water vapor. For those on sailing ships these areas were avoided. For example, Columbus did not attempt to sail across the Atlantic (he knew that would not work). He went south and picked up the winds blowing out of the High and headed to the southwest. When sailing from England (with napped; as in kidnapped) drunks on board they often reached the edges of the calm just about the time the “dead horse” (aka bar tab paid by the captain where the napping took place) was paid off. A ceremony using a straw horse effigy and the singing of shanties resulted. Search for the “Dead Horse shanty.” Also, here search for horse. Getting off topic here so now you are on your own. I’m looking at a couple of open tabs on my browser at the moment. One is NASA GOES west, an archive page of the same, and the other is the wind map. The satellite data is from 8 km elevation. The wind (surface) map shows a lot of air flow across the warm ocean surface in a region that appears on the satellite to be dry at 8 km elev. It would seem that a considerable amount of moisture is being picked up from west and south of the center of this low and being directed towards southern Cal. that is not showing on the satellite. In terms of the total water held how would the quantity/volume of water compare between the lower warmer air and that identified by the satellite at 8 km. Just trying understand Bastardi’s comment above. That long narrow band/stretch of dry air per the satellite data at 8 km is interesting. Could there be some sort of mega downdraft at/to lower elevations associated with this? Those archives are so much fun. Will be looking back at them again along with the precipitation reports for Cal. this weekend. One thing I can agree with Bastardi on is that weather is complex. When I was looking at this the other day, we did have a pretty good AR set up which I believe did at least contribute some of the moisture into the present closed low. So while this isn’t a Pineapple Express (AR), an earlier one probably had some contribution. By the way, there’s another beginning to set up farther to the west which has a chance (slight) of bringing a more AR-type of event to the west coast next week. Yes, it was partly observations from those years as well as from historical records of the past that made me wonder about the connection. California and further north into Oregon had a drought period from late 1974 through to 1977, before normal rains set back in. 1978 through 1980 were wet years.The late 1920s shows several years of drought until 1932 which was a wet year. 2010 to 2012 was wet. There is an offset in the records. I will take a closer look to see if the pattern can be better understood. Maybe the “One” did a rain dance on the greens. Ok people, nothing to see here. Its just another computer model crash. Get on with you lives people. Thanks for providing that most interesting link. I considered including both, but then I figured I’d have to hunt down air temperature maps and puzzle over dew point (and maybe wet bulb) temps too. While that northern water is cooler than the southern water, the dew point difference between water and air has a lot to do with how much water is evaporating from the surface. Given that the water vapor loop was showing lots of water over the northern region, I decided to leave out this layer of detail. I suspect Bastardi will have lots to say about this in his Saturday talk. I’ll see if I can get a note to him. I don’t know if the set-up that has developed over the past couple of weeks is unusual but it sure is interesting to me. The more links that are offered here and many open tabs on my browser has my attention. This is all really neat. Now after reviewing, and of course playing with, the archives going back a couple of weeks on the link provided by Mike Alger above, is there a similar site with data in the same format that would show actual observations that I could go back in time and walk forward? Anyone able to help? Whether it’s the “Pineapple Express” or a more complicated weather pattern, I hope it continues. Here in the central Rockies we get the bulk of our snow in March and April. If the moisture doesn’t arrive during that time of the year, then forest fires become a huge problem during the summer, just as they have the past few years. Thanks, A. Good article excellent movie. We keep on watching ENSO. Is there a way that I can view Bastardi’s Saturday talk as you made reference to? I checked his weatherbell site but found no references. I’ve been playing with http://earth.nullschool.net/#2014/03/01/1200Z/wind/surface/level/overlay=temp/orthographic=-136,30,672 and toggling between various data offered in the animations especially surface conditions (temp, RH, wind speed/direction, etc) and assuming the data/presentation is correct I’m having a problem with Bastardi’s “nonsense” statement (February 28, 2014 at 1:11 pm) in his earlier comment on this thread. I’m trying to understand just what the real nonsense is. > Is there a way that I can view Bastardi’s Saturday talk as you made reference to? I checked his weatherbell site but found no references. That implies today’s will be http://www.weatherbell.com/saturday-summary-march-1-2014 . The link (per your assumption) is not yet available. If your assumption on its location/URL is correct it may not become available for a day or so (my assumption). Maybe Bastardi will come on over to WUWT and straighten out any confusion I may have. Maybe even post a guest article. There’s probably a lot of lurkers here on this one. Anyway, what is the nonsense he referred to earlier? I would sincerely like to understand. There still will be no water however for CA farmers. O needs the drought crisis. Brown is going to spend $700 M on drought relief also. The whole central valley could flood and they will not release water that is piling up in reservoirs. All you see in Sacramento media is how Folsom won’t have enough water to cover the pumps (just last week), and nationally we keep seeing pictures from January of reservoirs that WERE empty. This will be a manufactured crisis almost as big as global warming itself. What’s amazing is the people of CA buy it all. I posted on weatherbell.com on this matter. This system came from well north of Hawaii, and precipitable waters near Hawaii are well below normal. Total water vapor does not show the relationship against the normals. The fact is the water is way above normal over the north Pacific and the very cold air that managed to come out over that resulted in uncommon deepening of this. The true pineapple connections so to speak usually occur in warm ensos and one can see high precipitable water being advected into the system from the south and southwest out of the subtropics, not lower than normal pws. This whole tendency to label and blame one thing, be it agw, or polar vortex of the man in the moon is disturbing to me. I dont think the reasons for the occurrences in the weather are simple 5 second sound bites. I think it does a disservice to label a storm that came out of the northern branch over the very waters what we keyed on for this winter as something that had some kind of origin in the tropics and subtropics. The fact is as wavelengths start to shorten at this time of the year, troughs buckle into sharper systems and if there is enough baroclinicity will do this. Give this came from the west northwest, and I show this in no uncertain terms in the weatherbell post, its no more a pineapple connection storm than something in the northatlantic that deepens. There is no one more acquainted with the connection out of the tropics with me. Paul Stokols of the medium range forecast center in the 1980s was one of the guys I learned from at PSU and was a nut about the Hawaiian connection and in the winters where he was a grad student at psu, he would show the cloud shots we could see of the subtropical jet firing up around Hawaii. You will see what I am saying next year because you will see higher PWS in there than this year, which has been paltry indeed and part of the overall cold PDO pattern of which we will have a bit of a break in with the enso, much like what we saw in 57-58 and other cold pdo warm enso situations. Joe, great comment!!!! I also thought the “pineapple express” was a bit odd in a conversation I was having with my wonderful boyfriend. Then I made the mistake of going to wiki and thought maybe it was. However, based on your comment, I am back to my original thought that this is not a Pineapple Express but could it be a Chinook Wind? I have another example of misnamed weather pattern variations. Take a look at the Antarctic Circumpolar Wave overtake Australia. Wonder what sort of misnamed Australia droughts have occurred in the media when they should be calling it an Antarctic Wave Drought. There are two things going on – and both can exist. If a parcel of air expands, it will be less dense. If a parcel of air warms it will expand and be less dense, unless pressure increases. The other issue has to due with relative humidity. This is only based on temperature of the air. The summer of 1957 was hot up in No California. My father had taken me and my brother up to Trinity County to go steelhead fishing for the first time. Temps were triple digit almost the entire time, ranging up to 116 and possibly a bit higher than that. That was the year that the hills around Clearlake burned. As we drove up highway 101 early in the morning, the early morning skies to the east of us were red with flames for many miles. Highway 101 was still a mess from the flood the year 55/56 before, all the way to Eureka. I don’t remember any summer being that hot since that time. I see that Joe Bastardi (March 1, 2014 at 8:39 am) is pointing out something worth noting about the origin (which is as plain as day on the illustrations to which I link below). You should understand two different forces here. Air both contracts under pressure and expands under warming. They can and do both exist. PV=nRT. V=nRT/P you know this right? @ Mario — Ha! So THERE you are. #(:)) Good pressure point at 1:25pm. Yes – Janice: David Thomas is a surgeon, I believe – so he should be educated on this subject –I only hope. @ Mario — lol. Good one. PS – again: There are two things going on here. One is relative humidity – related to air being able to hold moisture which increases with temperature – and volume which is related to pressure and temperature. Things cannot be distilled into simple answers the way the questions are posed in this thread. In CA, due to the relatively warm coastal water (~50 degree ocean) in winter, it’s relatively humid during winters, and relatively dry in summer when the relatively cold water (~55 degree) dries the warmer air. It’s nature’s air conditioning!! Some people don’t get that when it’s drier, the air heats up faster due to the lack of moisture. In the humid tropics, the latent heat energy of evaporation reduces temperature – even the the air contains much more energy in the tropics. The air in the Arctic contains very little energy because there is almost no latent heat of H2O there. That is why Chico CA gets higher temperatures in summer than Hawii, even though Hawaii gets much more sun light energy. Here are a couple articles about California’s water problem, which claim that it’s largely due to environmental politics. “This is not a drought year. The meager allotment is the result of too much water. Heavy rains in November and December created a water flush through the Delta, herding the threatened Delta smelt/minnow south, closer to water pumps that move water from the Delta to the San Luis Reservoir, a storage terminal near Los Banos, Calif., that collects state and federal project water for movement south to urban Californians and San Joaquin Valley farmers. To protect the endangered minnows, the pumps were periodically stopped through the winter. No pumps; no water south. Just water west into the ocean. The ridiculous environmental rules protecting the Delta minnow say the pumps can only gobble up 305 of the minnows in a water year, which ends Sept. 30. The count is already 232 — more than 75 percent of the limit. So to make sure pumps supply water to 25 million people and millions of acres of farmland consumes no more than four minnow buckets full of smelt — 800,000 acre-feet of water is gone. I am so confused now. I read that the fear mongers say that these storms are just rouge storms, and yet this article implies a series of rain storms from the pineapple express. Has that ever happened before?…. Of course I’m being sarcastic. To hell with people SAVE the minnows. more sarcasm.. There doesn’t seem to be much interest in the comments on this thread to follow the origin of the water vapor being transported to Cal. over the past several days. What you observed in your links is the same that I was seeing. I guess Bastardi gets a pass on this one unless some other Distinguished Meteorologist wants to pick it up from here. I don’t buy in to his claim that the storm/water vapor came from the north (though it was a contributor) but I’m just a country bumpkin so I now reluctantly yield to academic authority. The current rains really don’t amount to . . .
See if you can find a copy of J. M. Nash’s “El Niño” (2002) for long descriptions of this storm. Great find and post Janice. That explains why the summer of 1957 was so hot then, in part. That was an above average dry year, ie winter of 1956/57, which followed the flood year of 1955/56 in No Cal and Oregon. Then in 1974/75 through 1977 there were 3 years of drought, and it was also hot up in the mountains at that time. The drought broke in the winter of 1977/78. Out of interest, what are the objections to building a series of settling tanks covered with mesh sufficiently fine to keep the smelt out and pumping water for agriculture and domestic use in the area out of these? Apart from the fact that California State has the economy of a banana state that is? Thanks for sharing that. It was well worth listening to. I agree that the origin is on the tropical side. The more interesting thing is the interhemispheric exchange aligned precisely with California meridionally. The flow that I mentioned up above has mostly dissipated. That is what the pattern would like, except that it could not hold itself together. There was a lot of dry air space all around that system. Interesting to see you are still here. Looks like some of that WNW moisture my move in to Cal. Anyway I’ve got the associated links saved to bookmarks to watch this region. Prior to this lead post and thread I never had the inclination to look at the water vapor loops in this area that has an effect on US weather, even to the east coast. Yes, Kate, Mario, Janice, I’m a retired surgeon who sutured wounds without ever understanding how they healed. You got me. I started reading WUWT when I mistook albedo for libido and have been hooked ever since. You might be interested in reading my 2008 posting on “Davids Home Now” on medical care. Mario, I omitted 🙂 🙂 :). +++++++help me follow your train of thought –I am not following… dense I am.